For the past several years, we’ve decorated what we like to call our Christmas travel tree. [We wrote a blog post all about it that you can read HERE.] We had lots of help decorating for Christmas this year. Our daughter, Meghan, was home and we invited a couple local college students over. We also had the privilege of hosting Elodie, a young woman from France who we met on our cruise last summer. 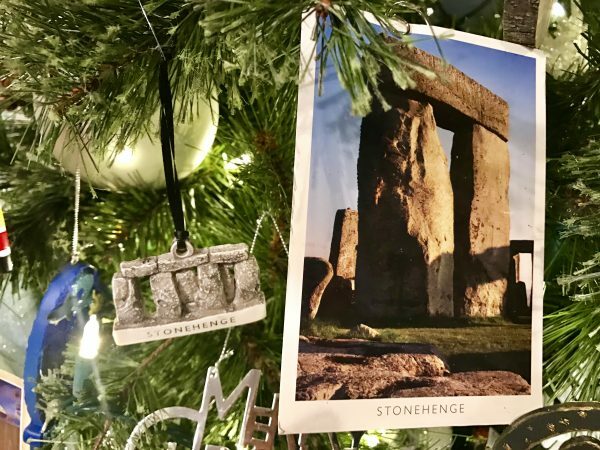 Each year, typically Thanksgiving weekend, we empty our postcard jar and select a few postcards that best represent our year in travel and they go right onto the tree. 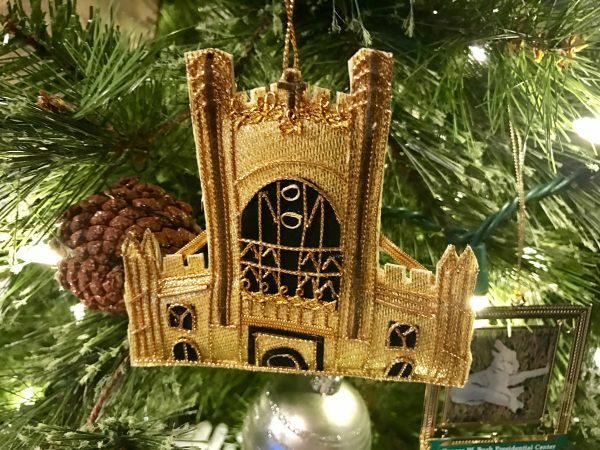 We also hang new ornaments purchased from places we visited that year. 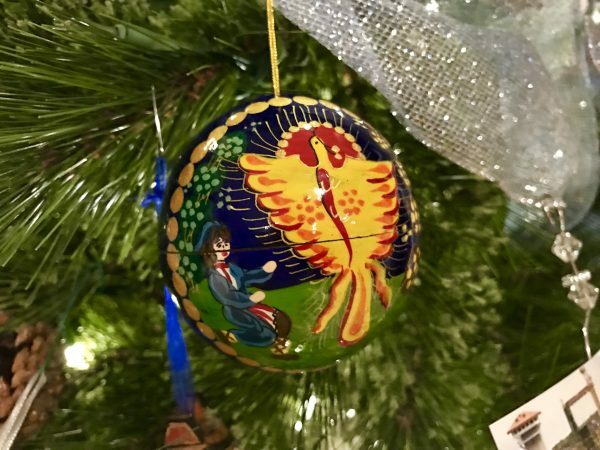 It’s always fun to find and unpack the ornaments and reminisce about all of the wonderful things we were able to see and do each year. Here’s what’s new to the tree in 2016. 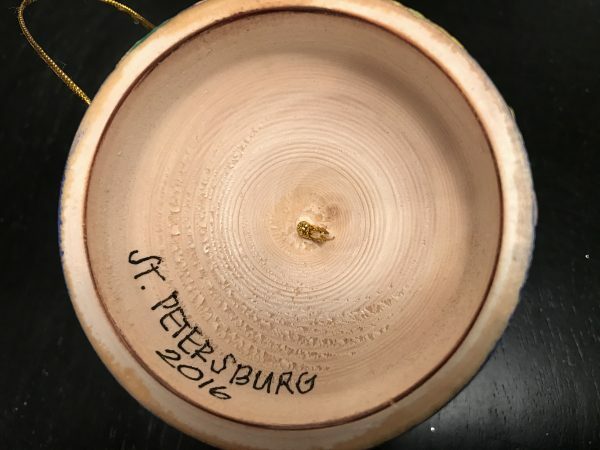 We purchased this ornament in St. Petersburg, Russia, this summer. It was our first, and quite possibly our last visit to this former Soviet city. While we enjoyed seeing iconic places like Peterhof and the Hermitage Museum, there was much about St. Petersburg that still represented very dark times for the people there. As a side note, when we get new ornaments for the tree, if they don’t already have a year on them, I usually try to add it with a Sharpie permanent marker to help us remember what year we traveled where. 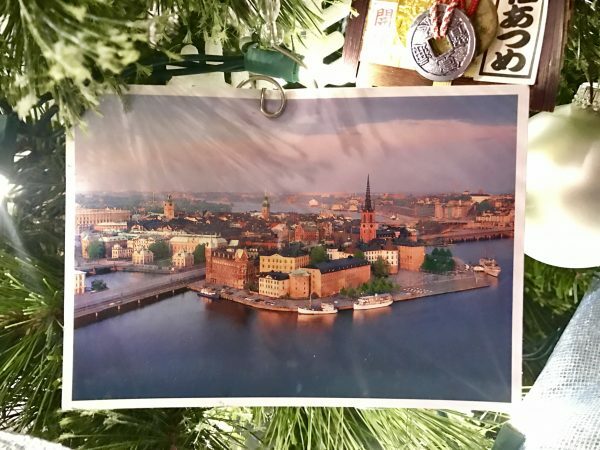 We put lots of new postcards on the tree this year, including two from Stockholm, Sweden. 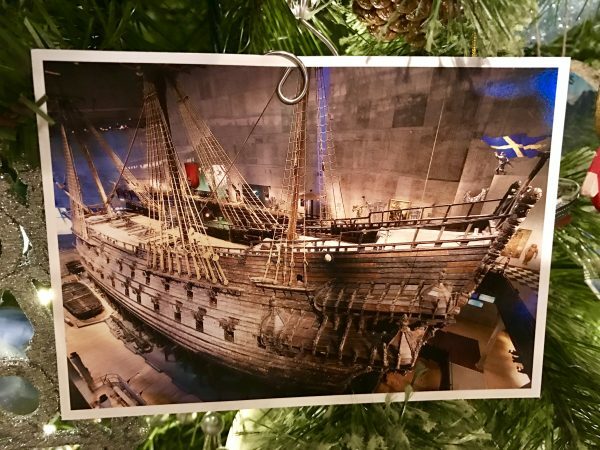 We were in Stockholm this summer while cruising on the Celebrity Eclipse and enjoyed a walking tour of the city, eating Swedish meatballs with pickles and lingonberries, and visiting the Vasa Museum. The Vasa Museum gave us a fascinating look at a salvaged ship that sank in 1628 and spent 333 years on the sea bed. Of course, we had to get a postcard there. Seeing Stonehenge in person for the first time was just amazing. It was our first stop after landing in London, England, this summer before embarking on our 14-night cruise through the Baltic Sea. We had both wanted to visit this iconic structure and we joined hundreds of other tourists that day who walked around the enormous stone structures shaking our heads. CLICK HERE for five interesting things we learned about Stonehenge. Just three weeks later, we were back in our home state of Nebraska and couldn’t resist a stop at our own iconic replica — Carhenge, near Alliance, Nebraska. This crazy creation in the middle of a field is a Midwest favorite and a must-see when traveling the western end of the state. We wrote a blog post about it that you can read HERE. 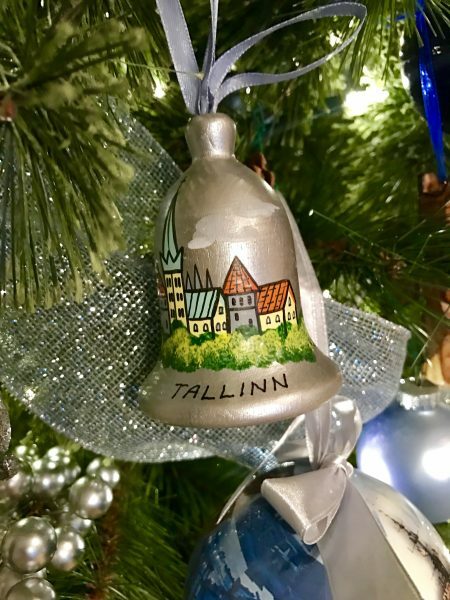 This beautiful, hand painted ornament was one we found at a small, local shop in one of our favorite places, Tallinn, Estonia. We just loved Tallinn and it’s pastel buildings, colorful markets, and welcoming people. When we returned to England at the end of our cruise, we took a few days to explore some more of Great Britain. We took a train to Bath, England, and quickly wished we would have allowed more time in this incredible city. 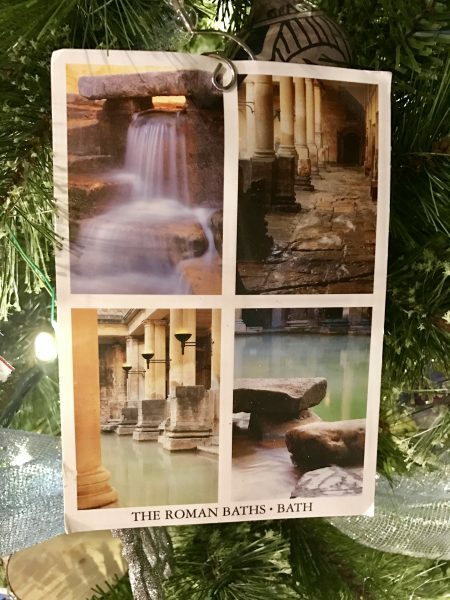 We toured the ancient Roman baths and even had a chance to soak in the thermal waters at the The Gainsborough Bath Spa. It was truly one of the most relaxing, luxurious days we’ve ever had. In Bath, we also visited the Bath Abbey — twice. We stumbled upon it while walking the city streets and were absolutely amazed when we went inside. We’ve been to dozens of churches, cathedrals and abbeys on our travels, but there was something very different about this one. It was SO ACTIVE. There was organ music playing, children singing, and displays throughout that demonstrated the various ongoing ministries of the church. We spent a lot of time here and couldn’t resist purchasing a few books and this ornament from the gift shop before we left. Just two days after returning from our summer vacation in Europe, our daughter, Meghan joined us for a week-long trip across Nebraska. We had a wonderful time exploring towns like Hastings, Grand Island, Scottsbluff, Crawford, Chadron, Valentine, and Norfolk. 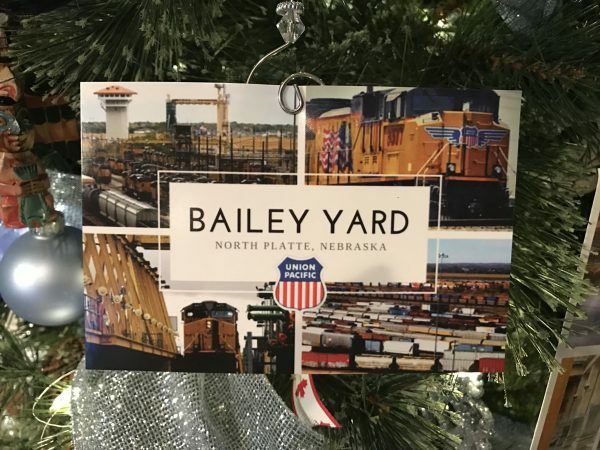 One of our favorite stops was Bailey Yard in North Platte. It is the largest railroad classification yard in the world and hosts a great display on the North Platte Canteen. 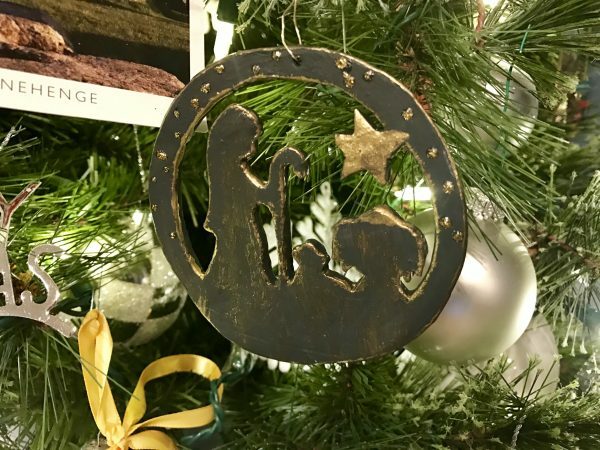 We picked up this ornament by local artist Beverly Clappsaddle at the Clear Lake Arts Center in Clear Lake, Iowa, this fall. We were on our way back from a visit to the Mayo Clinic in Rochester, Minnesota, when our travel blogging friend Sara, from Travel With Sara, mentioned a holiday open house in Clear Lake just as we were about to pass through there. We decided to make an unanticipated stop and were not disappointed. 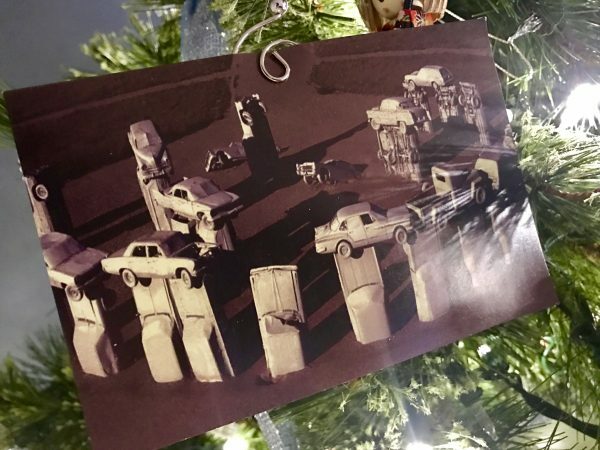 The last postcard we decided to add to the tree this year was one we picked up in Norfolk, Nebraska, this summer. 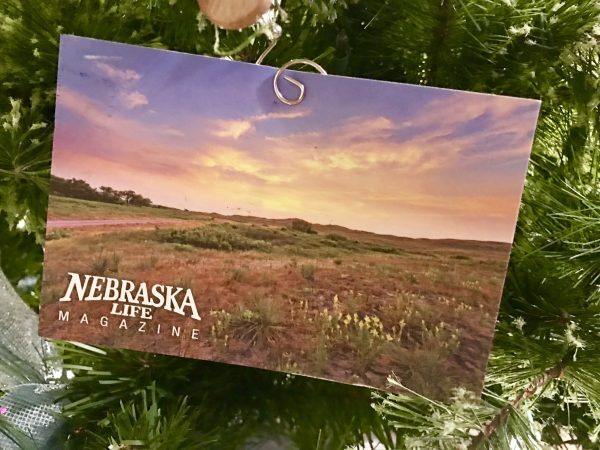 It is from our visit to the Nebraska Life Magazine office and is a great reminder that while we love traveling the world, it is always good to come home to The Good Life.